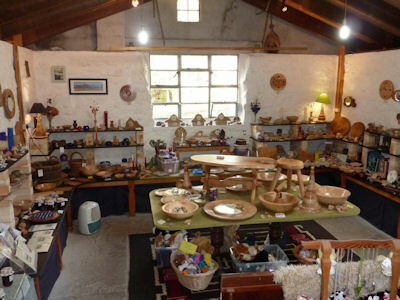 Kilmory Workshop Handmade Woodwork and Stoneware Pottery. Fine woodwork made by Dave Furze from timber grown on the Isle of Arran. The trees are planked, seasoned and hand crafted into beautiful items on the premises. From tree to finished article, woodturning includes bowls, rolling pins, breadboards, vases, lampbases, mirrors, barometers and clocks. Furniture includes coffee tables, bedside cabinets, chairs and more all with an oiled finish. Housesigns made from oak and finished with a microporous varnish. A variety of woods are used including ash, oak, sycamore, elm, larch, beech, birch, laburnum, horse and sweet chestnut. Domestic stoneware pottery hand thrown by Carol Furze and glazed with with a variety of colours, dark blue/cream, medium blue/cream, claret/white and cream with a blue edge. Also a range of pierced bowls, perfume burners and pot pourri dishes. Pieces to use and delight. Saturday to Monday sometimes--when the flag is flying and the sign is at open at the end of the road by the church. Tel: 01770870310 to check if we are open.